This year has been dubbed the “catch up year” for us. Why? Because there’s so much we want and need to do this year and our wallets need to catch up to our dreams. LOL. It all requires money, money, and more money. My husband and I already have remote jobs (we’re Independent Contractors for tech companies). But we want to make more money than those companies can pay us. So the bottom line is, we’ve gotta get aggressive about increasing our income and decreasing our spending. Neither my husband nor I think clocking more hours at a job is the way to go. We want real financial freedom – the kind that you get when you stop trading your time for money. The kind that will allow us to spend time with our family and do work that matters to us. If you’re trying to start a side hustle, I’d recommend doing the same thing. To be honest, some “side hustle” opportunities, can be a complete waste of time. They’re fine if you just want a little extra pocket change. But, if you need to make a significant amount of cash to help you hit your personal goals, then you’ve gotta be picky. Come up with your own list of criteria and use it to choose your next side hustle. In case you’re wondering, yes, bloggers can make A LOT of money. 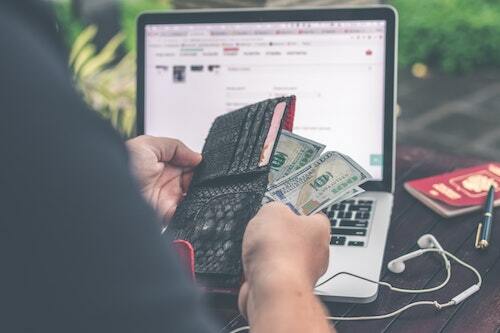 I know of several bloggers who make 6 and 7 figures from their blogs. One of the ways they do that is through Ads. I’m at the VERY beginning of my blogging journey and I have so much to learn. There’s a lot that goes into blogging, so right now it may not meet my $30/hr requirement. However, there’s a potential to make a full-time living with blogging so it’s worth the investment. Affiliate marketing programs pay me for recommending products/services I love. I sign up for an Affiliate Network. When I write blog posts about products/services I love, I link to those products using a special link, called an affiliate link. When you click on my affiliate link and sign up for that product/service, I get paid. Again, it’ll take some time to see a significant amount of Affiliate income from my blog, but the potential payoff makes it worth the time. Amazon Associates | https://affiliate-program.amazon.com/ – get paid for promoting products on Amazon. Commission Junction | https://signup.cj.com/member/signup/publisher/#/ – They have a huge selection of brands you can promote. Affiliate Marketing is not a bad deal at all considering I’m just sharing things I really like. Blogging sounds easy, but is actually a ton of work. So I’m also trying something a little more straightforward. I’m signing up for a few user testing websites. The concept is pretty simple. Companies want to make sure that people find their websites and apps easy to use. They hire these User Testing platforms to find people like you and me, who are willing to test their website/app. So basically, I provide feedback on websites, and they pay me. I have a tech background, so this option really is easy as pie. Plus, on average a test is about 20 minutes and pays $10, so it meets my $30/hr requirement. UserLytics – This site will pay you between $5 – $20 per project. According to their site, certain projects will pay up to $90. BetaTesting -This site will pay you $10/test for trying out new sites and apps, and giving feedback on your experience. UserTesting – Similarly to the other sites, this one pays you $10 for every 20 minute test you take. I’m still in the research phase for a lot of this, so to start I’ll choose a few User Testing platforms to try. Then I’ll do an Income Report with a detailed explanation of how each one worked for me. I’ll also go into more detail about what’s required for each, so you can follow along step-by-step if you want to give them a try. 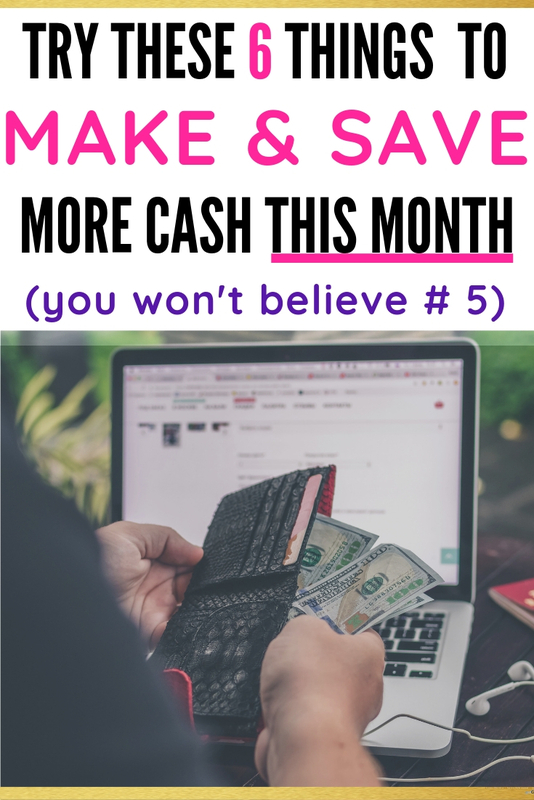 So after taking a look at our budget, here are 3 ways we can save more cash. Sigh… “Bye, bye Hulu.” I’m going through my list of monthly expenses and cutting the stuff that’s not necessary. My husband and I switched to T-mobile 2 years ago and our monthly bill is about $150. It’s not terrible, but it’s still more than I want to pay. Technically our plan should only cost us $100, but we’re STILL paying off the phones. We both have iPhone 7’s and we’re okay with holding on to them for as long as possible. So this month, we are going to start paying our phones off completely. Once we do that, that’ll bring our monthly bill down by $50/month. That’s an extra $50/month or $600/yr we can save or put towards paying off other debt. I also looked into switching to Republic Wireless, which I heard about from Michelle, the blogger behind Making Sense of Cents. She and her hubby use it and they spend a whopping $50/month on their phone bills! You heard me, $50 for TWO phone plans. Unfortunately, they only work with Android phones, and since Hubby and I both have iPhones, we’d have to pay for new phones if we switched to them. That’d end up costing us more money upfront, and wouldn’t be the best choice for us right now. However, if you already have an Android and are looking to switch, I highly recommend checking them out – they have plans around $15/month! And, from what I understand their service is really good. Also, I just found out they’re having an awesome promotion right now for new subscribers for 2 Months Free Service! If you want to check them out, you can use my affiliate link below. Get 2 Months Of Free Service When You Switch To Republic Wireless Now! We spend so much on food, it’s actually ridiculous. I think we average about $500/mo on food for just the TWO of us – crazy, right? I’m not a chef, I don’t really like cooking, and I need as much help as I can get planning delicious meals. So, I’m using their free trial right now and if I like it, then I’ll continue on with it. I’ll be trying these strategies for the next month. When I’m done, I’ll figure out what works and what doesn’t so I can switch up my strategy. I have high hopes for each of these strategies so I’m excited to see how it goes. Can I be real with you? There are so many things my husband and I want to do and sometimes it feels overwhelming. But we’re trusting God to give us the grace and wisdom to get it done. If you’re in the same boat, let me remind you that no matter how big your goals are, the only way to accomplish them is to start working on them. What about you? 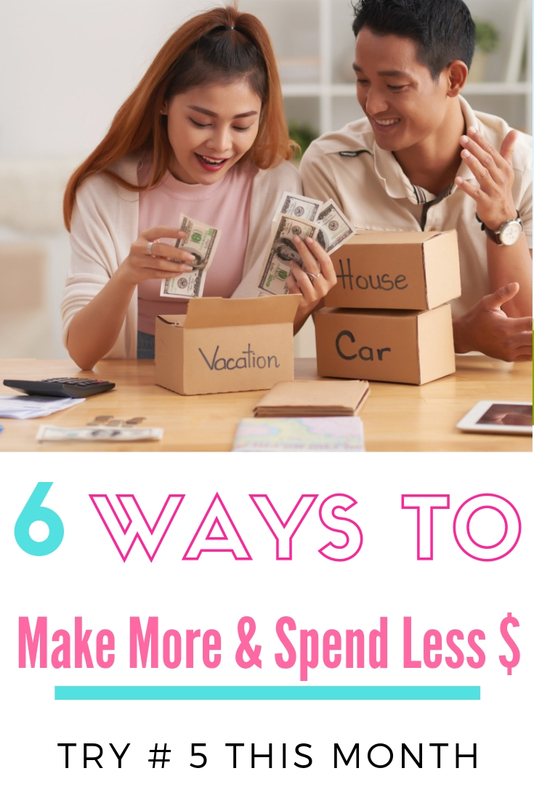 Do you have any side hustle or money saving tips that you really like or want to try? If so, let me know in the comments below. I’ll be testing a ton of stuff over the next few months and sharing it with you guys.